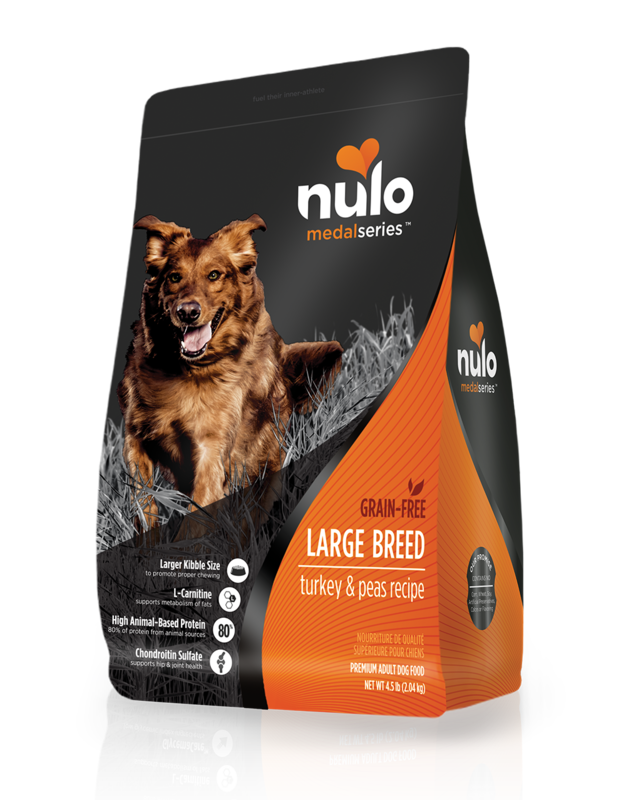 Big dogs mean big appetites and finding the right nutrition to fuel your large breed dog can be challenging. 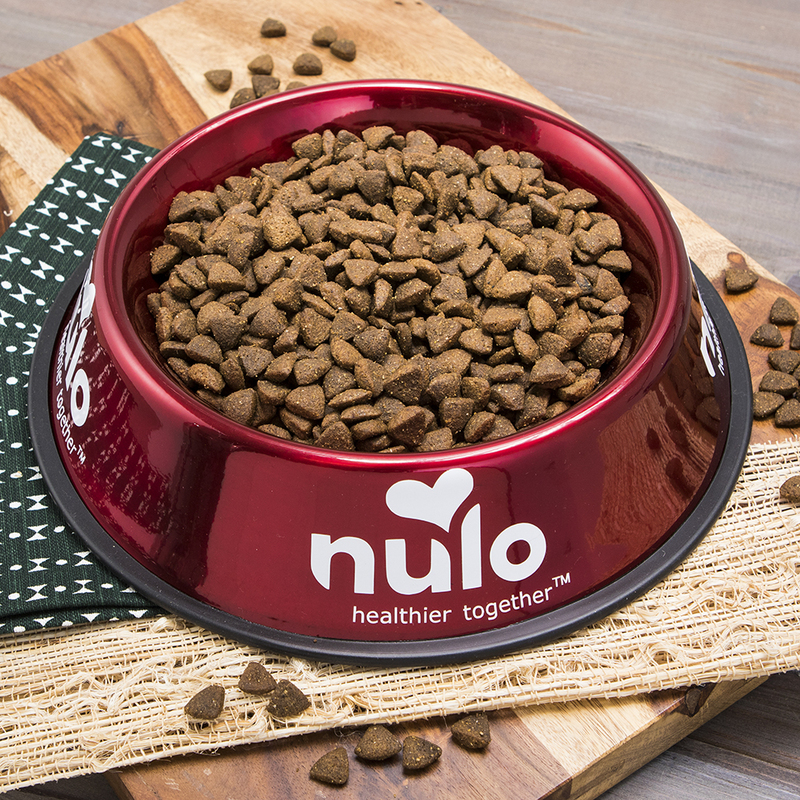 Nulo MedalSeries™ Large Breed Recipe has all the same benefits as our other formulas – high meat protein, grain-free diet and low carbohydrate ingredients – but includes a larger kibble size for healthy chewing and L-Carnitine to support the metabolism of fats. AVAILABLE IN 24 LB BAGS. Supports the metabolism of fats. To support hip & joint health. Deboned Turkey, Chicken Meal, Menhaden Fish Meal, Whole Peas, Sweet Potato, Chicken Fat (preserved with Mixed Tocopherols & Citric Acid), Lentils, Pea Fiber, Deboned Trout, Natural Turkey Flavor, Yeast Culture, Dried Chicory Root, Potassium Chloride, Dried Tomatoes, Dried Carrots, Dried Apples, Dried Blueberries, Calcium Carbonate, Salt, Glucosamine Hydrochloride, Chondroitin Sulfate, Sweet Fennel, Dandelion, Chamomile, L-Carnitine, Zinc Proteinate, Vitamin E Supplement, L-Ascorbyl-2-Polyphosphate (source of Vitamin C), Iron Proteinate, Niacin, Copper Proteinate, Choline Chloride, Thiamine Mononitrate (source of Vitamin B1), Calcium Pantothenate, Vitamin A Supplement, Manganous Oxide, Pyridoxine Hydrochloride (source of Vitamin B6), Sodium Selenite, Riboflavin, Vitamin D3 Supplement, Biotin, Dried Bacillus coagulans Fermentation Product, Vitamin B12 Supplement, Calcium Iodate, Folic Acid, Rosemary Extract. 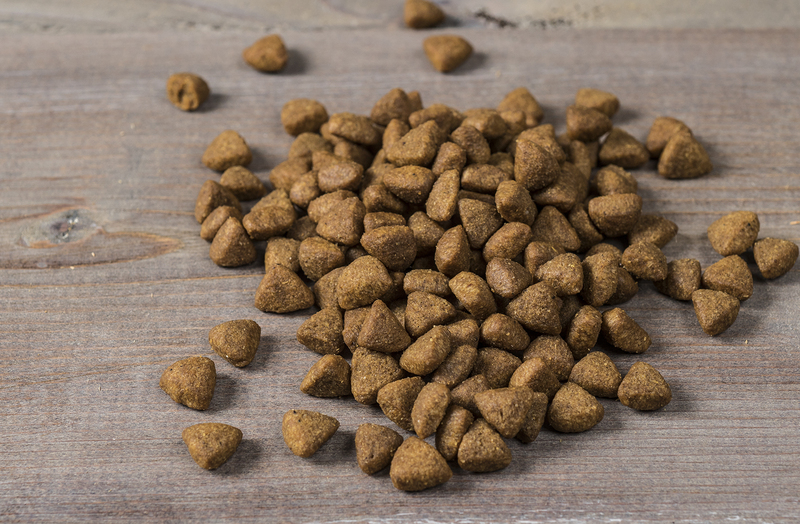 MedalSeries Large Breed Turkey & Peas Recipe is formulated to meet the nutritional levels established by the AAFCO Dog Food Nutrient Profiles for maintenance.